Founded in 1996, Ningbo Yuxing Water-Meter Limited Company is a backbone enterprise in the national water meter industry. Covering a total land area of 10,000 square meters, with factory workshops accounting for 7,000 square meters, our facilities are equipped with some of the most advanced production equipment and a well-seasoned technical team. We currently manufacture Class A, B and C water meters in 15 to 200mm specifications in water meters,Single-jet Water Meter,Multi-jet Water Meter,Plastic Water Meter, Woltman Water Meter, Remote reading water meters ,Rotary Piston type Water Meter.. Our Class C and D meters include 15 and 20mm rotary piston volumetric water meters. Carrying out all production from raw material processing to finished products, our annual capacity is 1,200,000 sets. 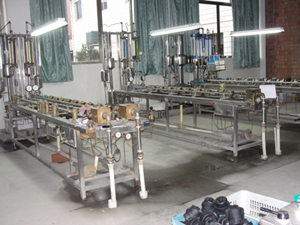 Yuxing water meters were appraised as "Light Industrial Goods Trustworthy Quality Enterprises" by the Technical Supervision Bureau of Zhejiang Province. In addition, our products are approved every year in spot checks for product quality in the market by the Technical Supervision State Bureau. We obeys the principle of quality is life, credit is guarantee and customers are God to strive for perfection. And we insists on scientific quality control system and strict enterprise management system to make the Yuxing water meters a top-quality water meter. The quality policy of the company: BRAND PRODUCTS WITH BEST SERVICE Let customers be satisfied and seek the development of enterprise.